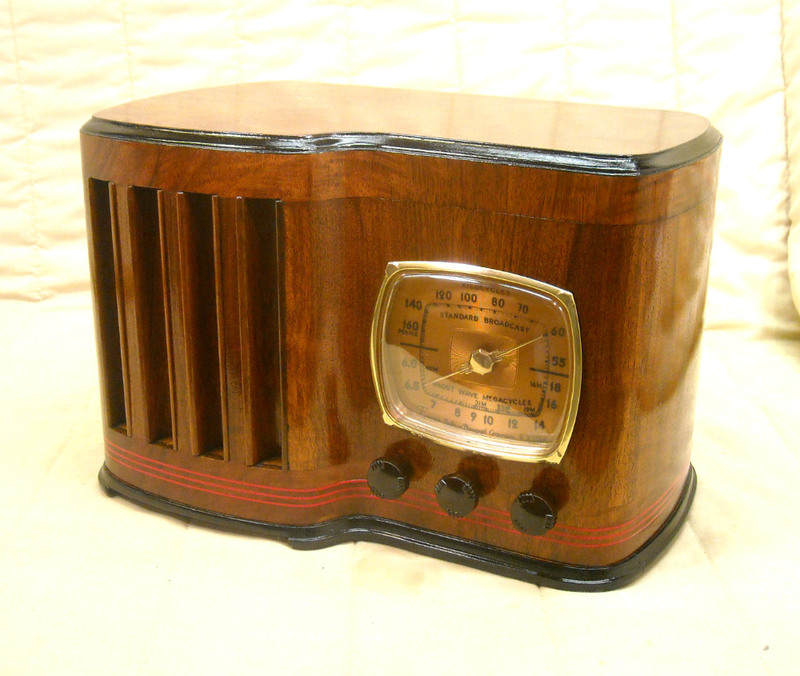 A new selction of antique radios are posted frequently so check back often. Last update was on 04/25/2019. 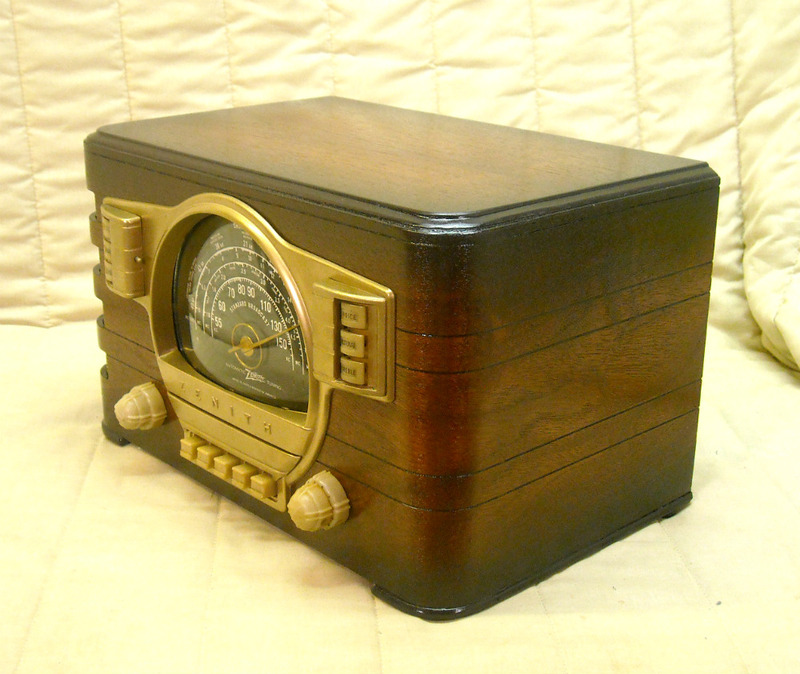 All of our radios listed for sale or on eBay have received our professional cabinet restoration and electronic repairs so they are ready for your listening and displaying pleasure. 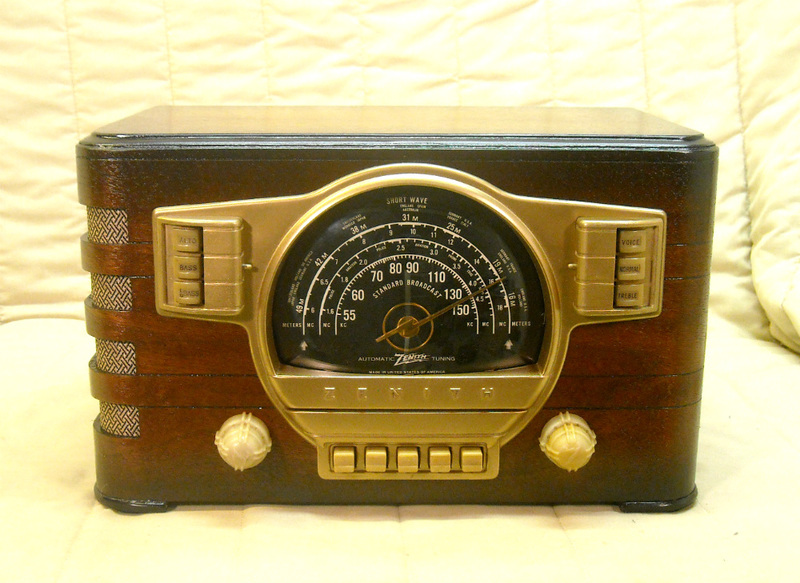 The perfect gift for an antique radio enthusiast! This brand new wall clock features an image of a lighted Zenith black dial with a magic green tuning eye. 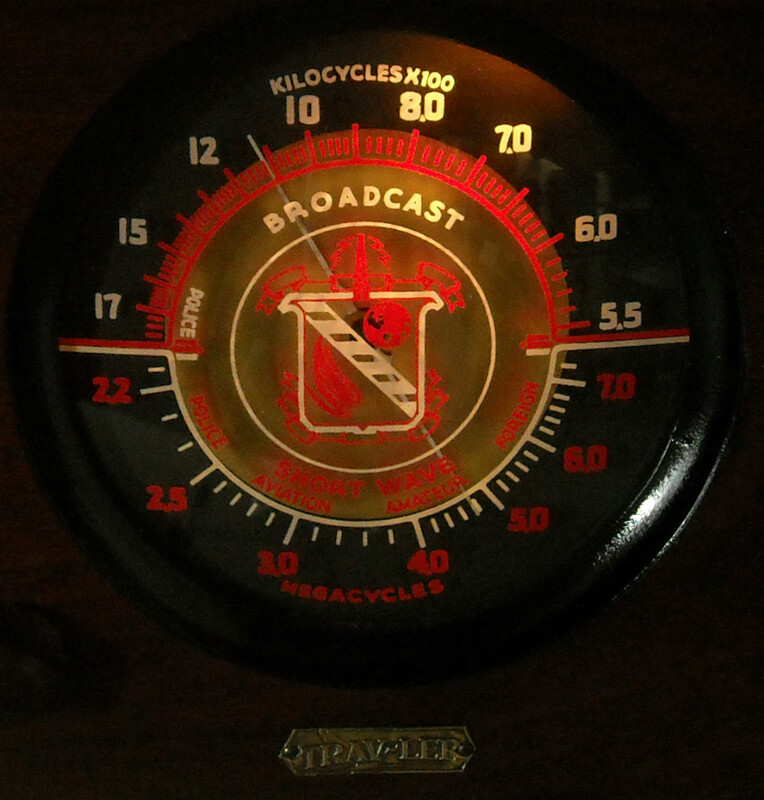 What an impressive sight, of an iconic dial, that graced the front of many tube radios during the 1930's and 40's. 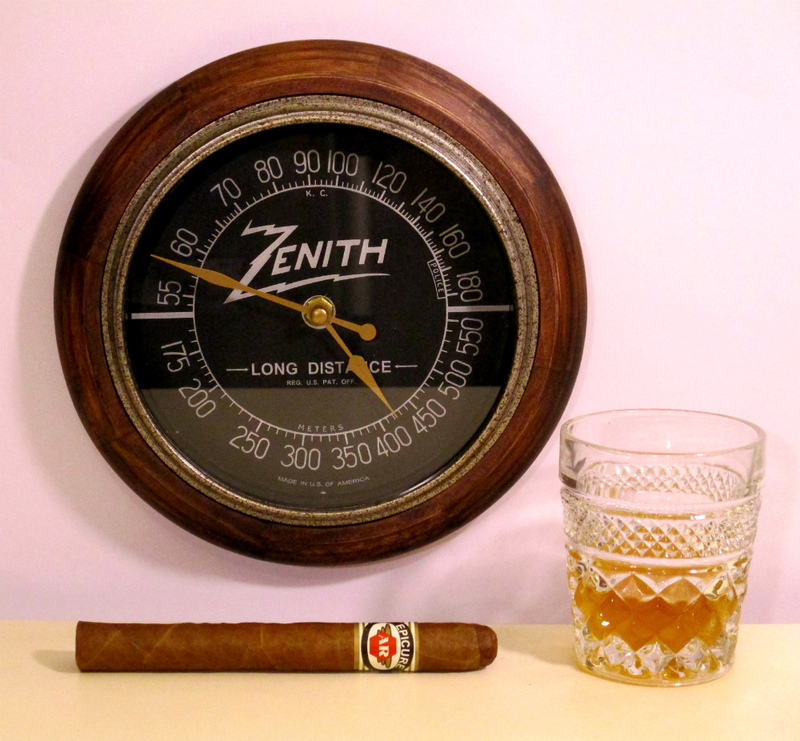 The frame of the clock is genuine wood with rustic metal trim, gold hands and a glass lens. The clock keeps perfect time with quality Quartz accuracy. Uses one AA battery which is included. Diameter of clock 8.88". We are often asked how we got the clock to look like it is actually lighted. 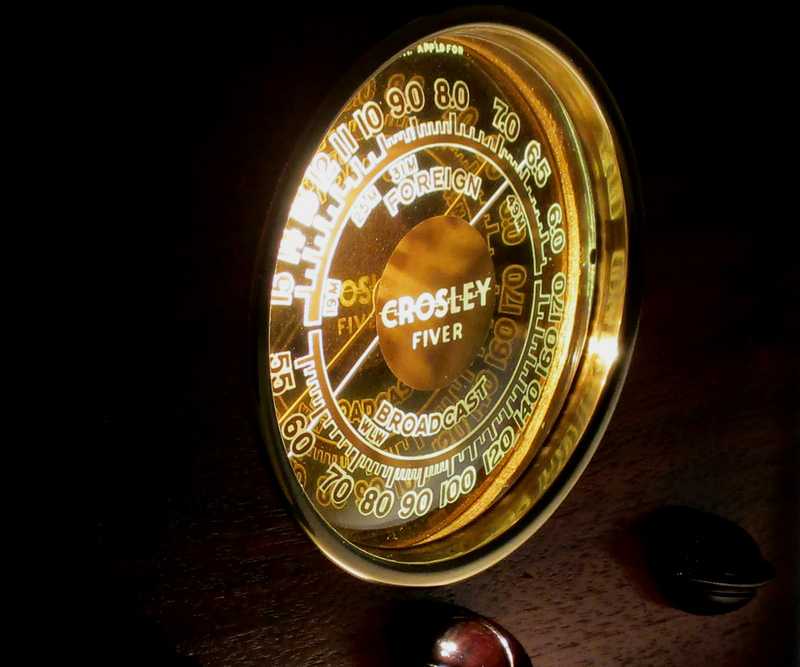 The clock face is a very high resolution photo of one of our actual Zenith black dial's taken while lit. Each face is printed on the highest quality/pound stock and not copied. That is how we achieve the unique look of an actual lighted dial. Click on the clock’s picture for larger and additional views. 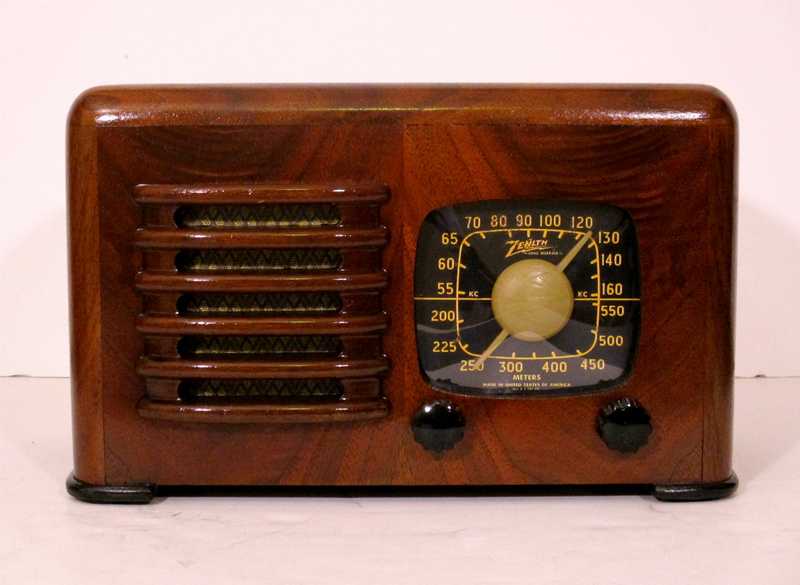 The perfect gift for an antique radio enthusiast! 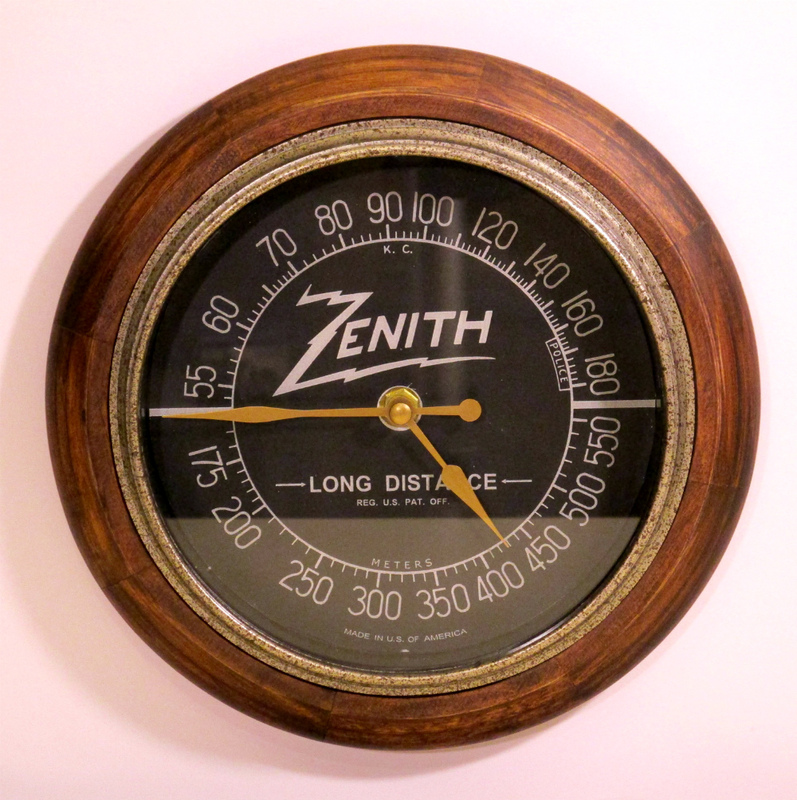 This brand new wall clock features Zenith's iconic black dial face that was used on many of their tube radios during the 1930's and 40's. The frame of the clock is genuine wood with rustic metal trim, gold hands and a glass lens. The clock keeps perfect time with quality Quartz accuracy. Uses one AA battery which is included. Diameter of clock 8.88". Click on the clock’s picture for larger and additional views. 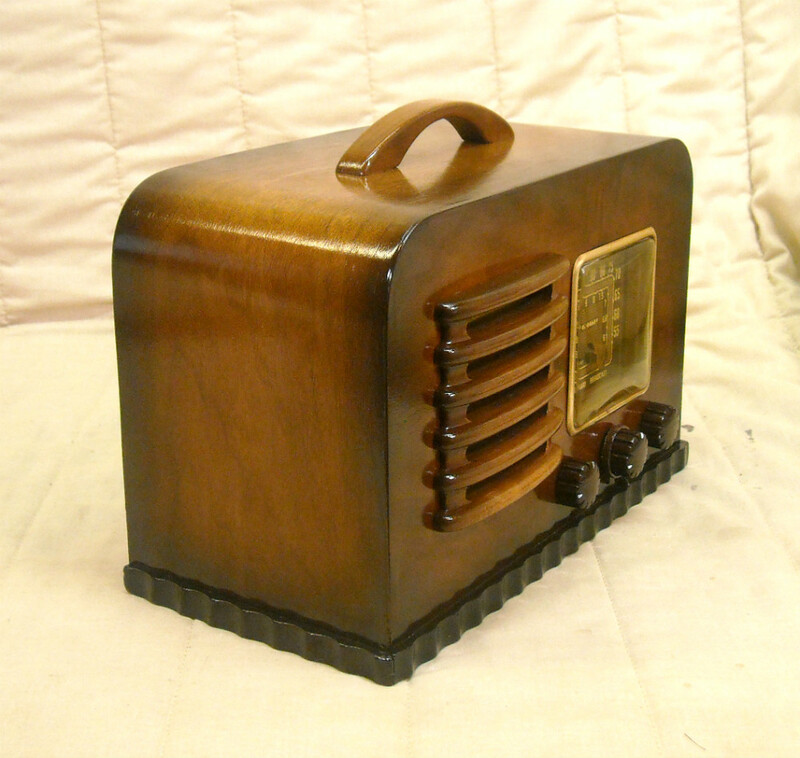 Here we have a stunning 1942 Zenith model 6D2614 table top tube radio. 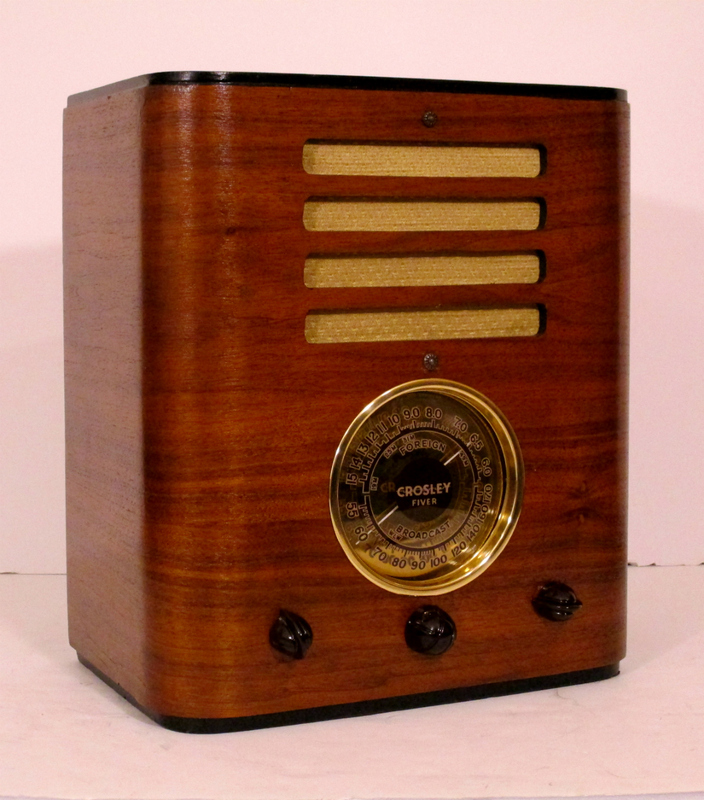 Designed by Robert Davol Budlong, one of Zenith's most prolific engineers, this was one of the last Zenith table top radios to be produced while the United States was entering WWII and Zenith was changing it's lines over to wartime production. 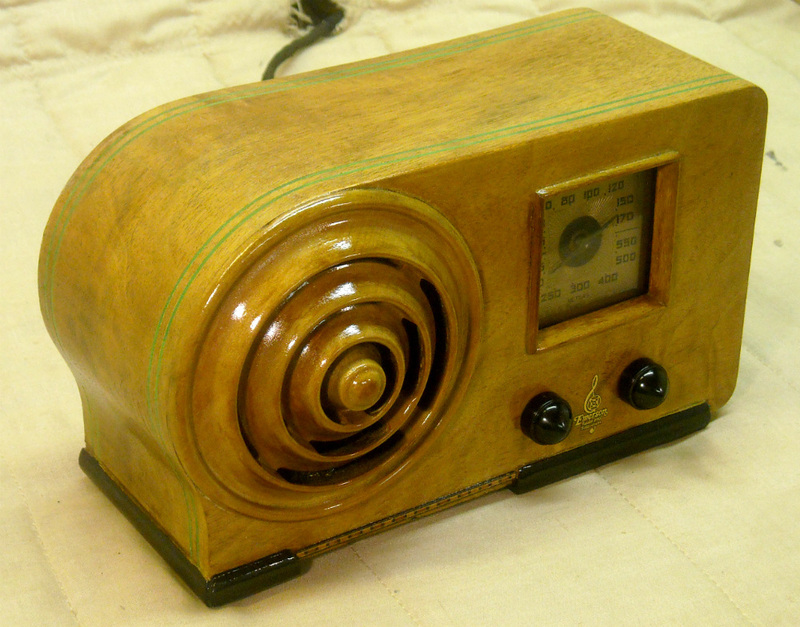 The radio is commonly referred to as the 'Boomerang' for its uniquely shaped dial and features a gorgeous American Walnut cabinet, great Art Deco appeal, built in loop antenna and excellent performance. 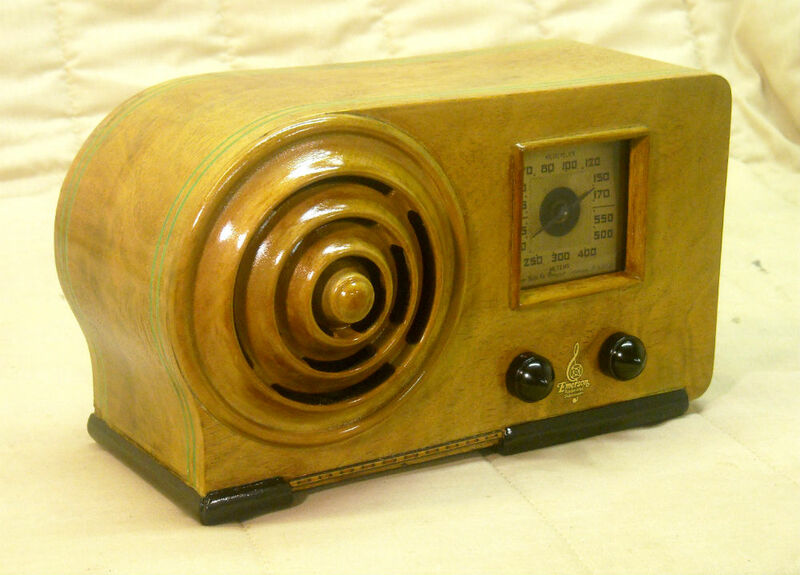 Click on the radio’s picture for larger and additional views. 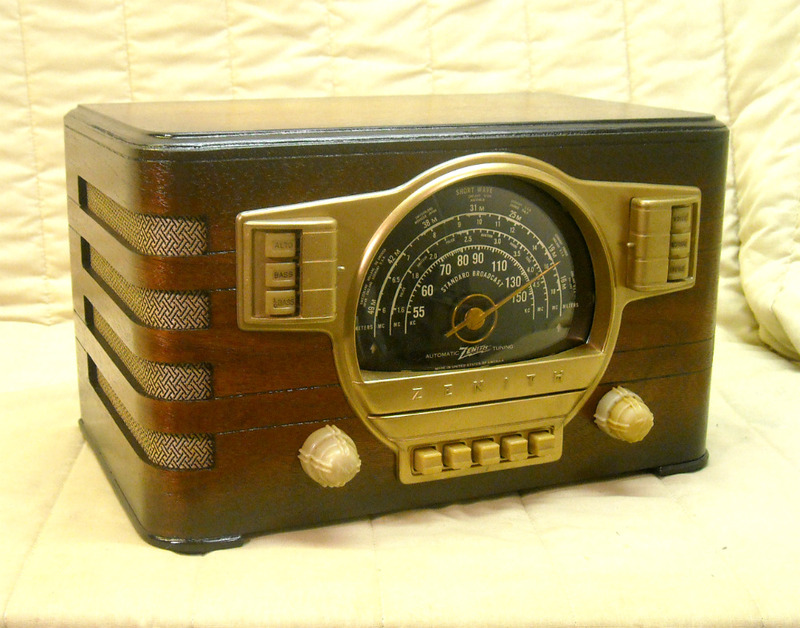 You'll be hard pressed to find a finer example of this classic; an absolutely stunning 1941 Zenith model 6-D-525 table top tube radio. Nicknamed the ‘Toaster’ due to its shape, and unique vent slits running across the cabinet, this set features a gorgeous solid walnut cabinet, superior craftsmanship, lighted black dial, built in loop antenna and fantastic performance. 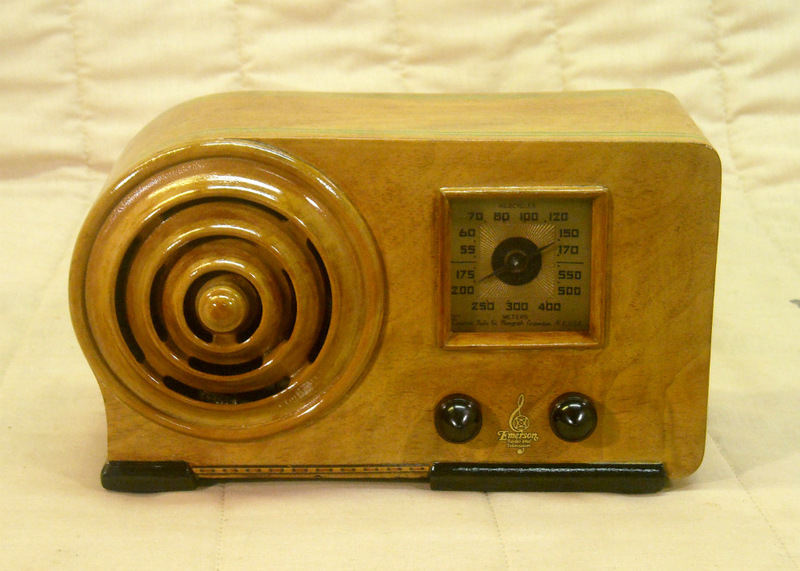 Click on the radio’s picture for larger and additional views. 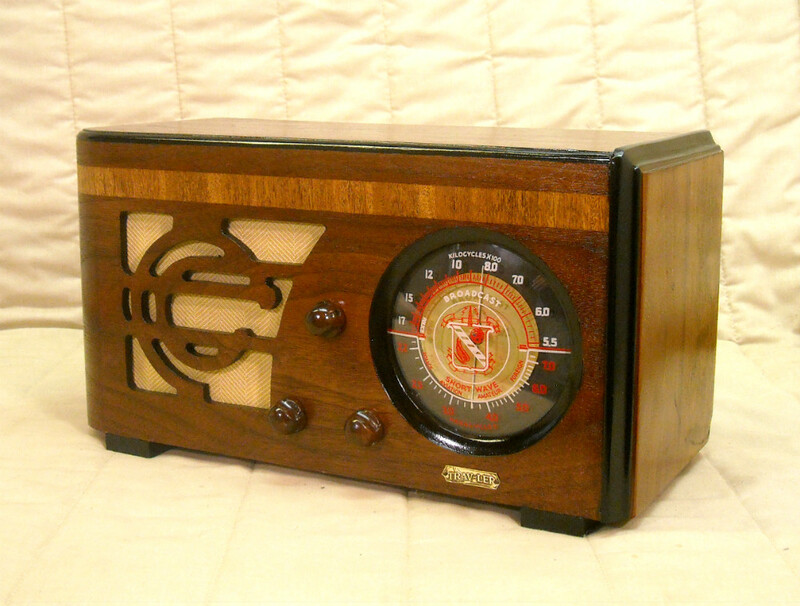 Here we have the highly desirable 1937 Crosley 'Fiver' model 517 mirror dial table top tube radio. It features a gorgeous American Walnut cabinet, lighted mirror dial which creates stunning reflections and 3D like effect, great Art Deco appeal and excellent performance. 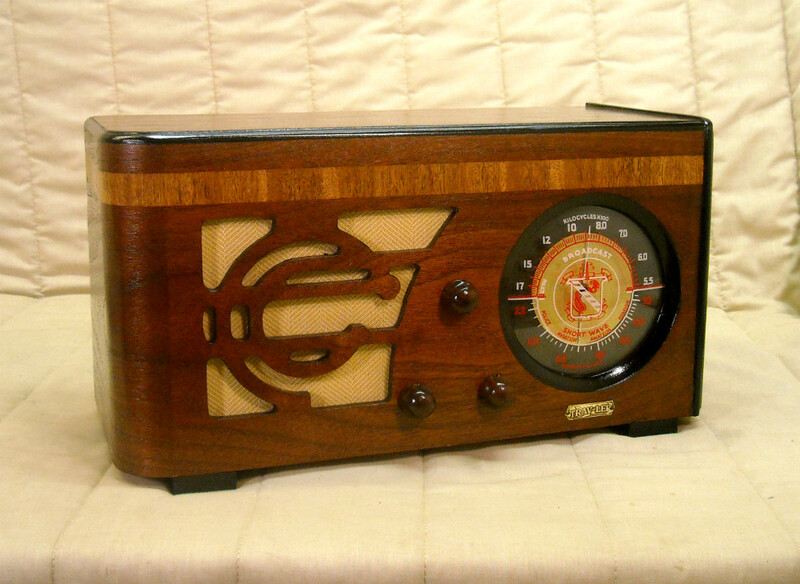 Click on the radio’s picture for larger and additional views. 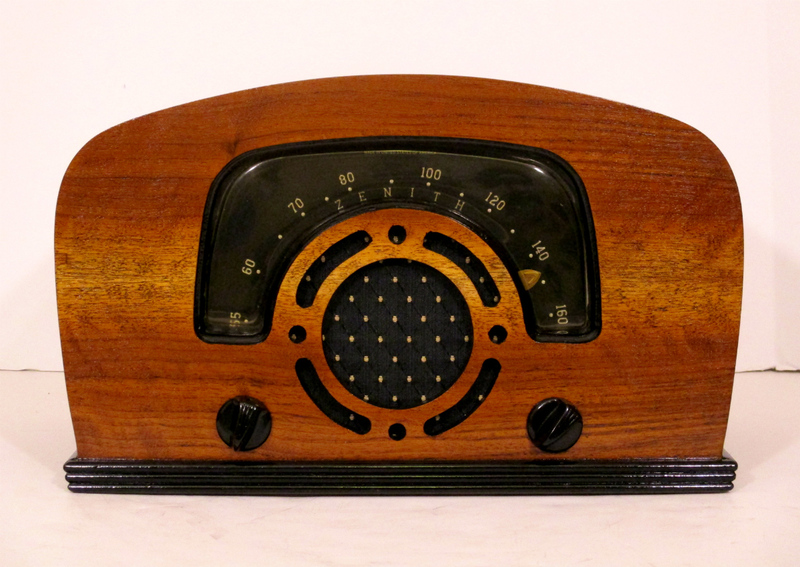 The perfect gift for an antique radio enthusiast! 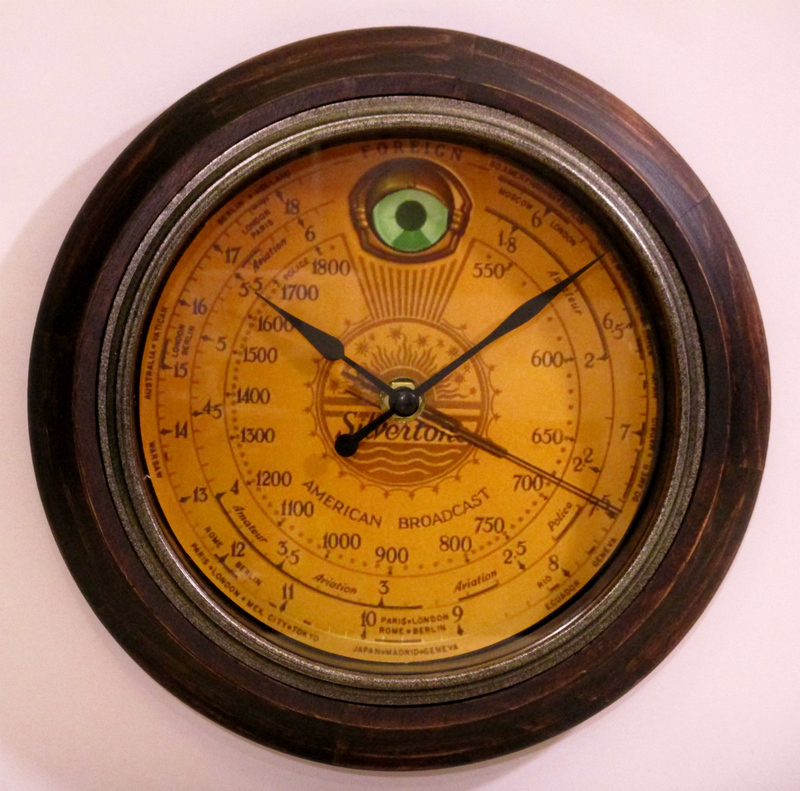 This brand new wall clock features an image of Silvertone's popular gold dial with a magic green tuning eye that graced the front of many of their radios during the 1930's and 40's. 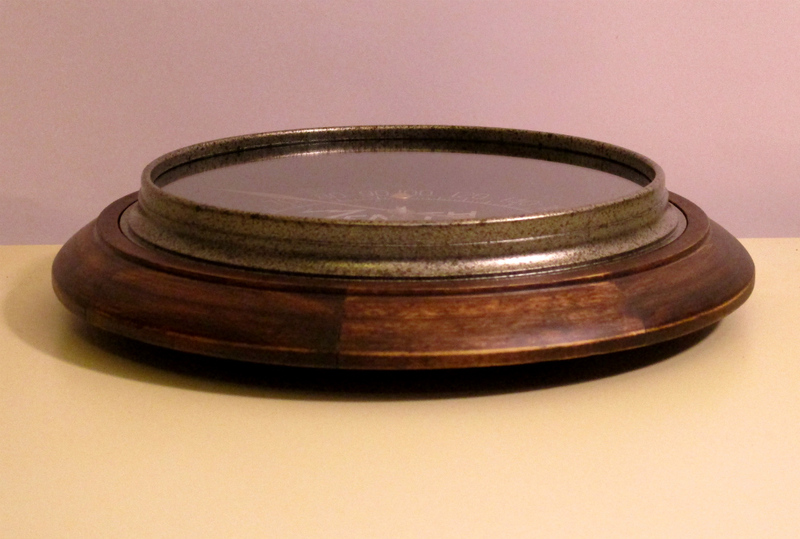 The frame of the clock is genuine wood with rustic metal like trim, black minute & hour hands (dial pointer is part of image) and a glass lens. The clock keeps perfect time with quality Quartz accuracy. Uses one AA battery which is included. Diameter of clock 8.88". Click on the clock’s picture for larger and additional views. 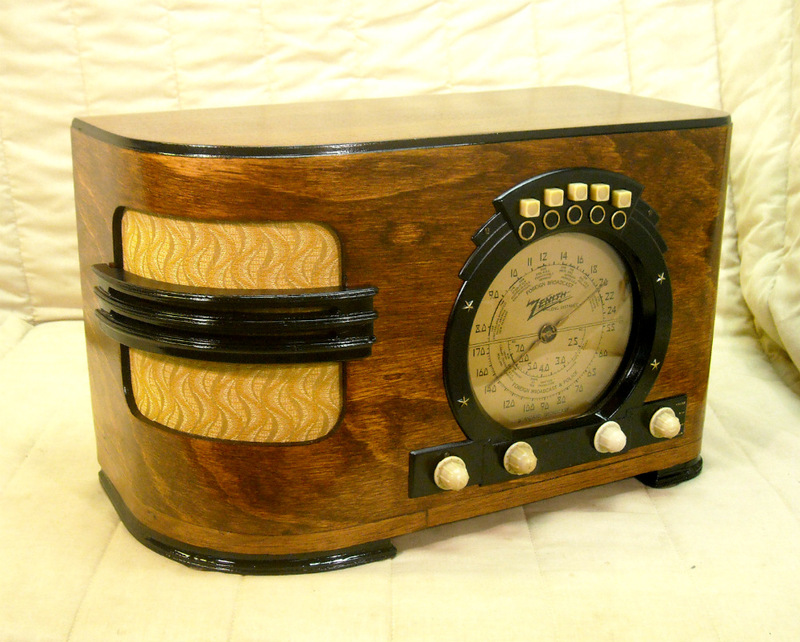 Here we have one of Zenith’s top of the line table models in 1941. And you’ll be hard pressed to find a nicer example. This model 7-S-529 features a gorgeous American walnut cabinet with a large wrap around grill. Jet black trim and dark walnut tones add the perfect contrast. The spectacular black dial, surrounded by numerous tone and automatic tuning controls, is a real eye catcher! 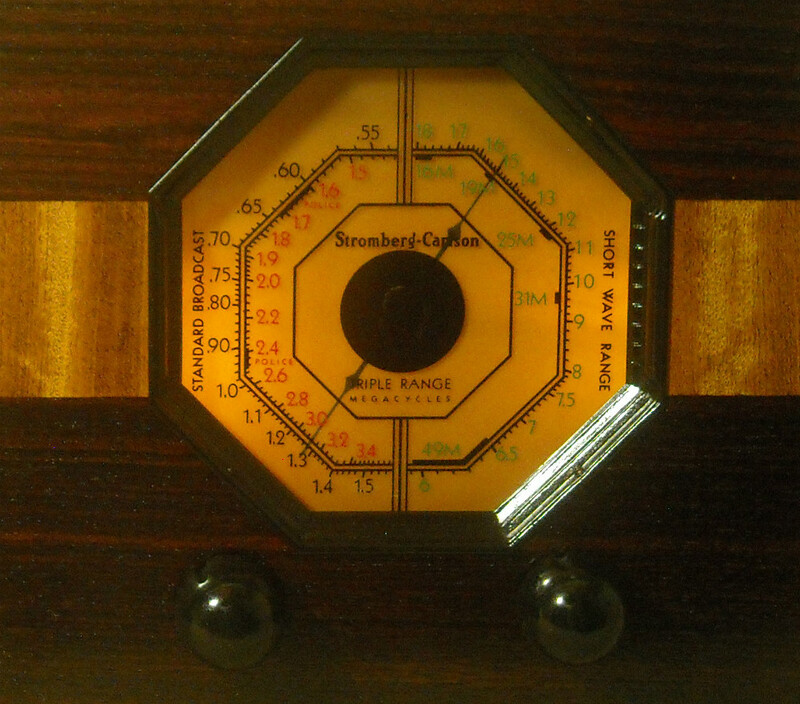 It is illuminated by two new dial lamps and displays all the station frequencies for three separate bands (AM broadcast, now defunct police, and shortwave), as well as country names, for shortwave reference. White arrow indicators, located on the bottom of the dial, let you know which band you are currently listening to. All numbers and letters on the dial are legible and show very little signs of wear. A large gold escutcheon surrounds the dial and houses various tone controls, as well as automatic tuning pushbuttons at the bottom. Due to the age and delicacy of the auto tuning mechanism, it is recommended that you use the manual tuning knob. The dial glass is clear and free from any chips, breaks, or cracks. All knobs are in excellent shape and work as follows; band switch, manual tuning and on/off and volume. The powerful 7 tube chassis is a tremendous performer! Using just the loop antenna I am able to pick up many stations, near and far, across the AM broadcast and shortwave bands. The radio provides deep rich tone and plenty of volume. Approximate dimensions are 15 1/2” W x 9 1/2” H x 9 3/4” D. Click on the radio’s picture for larger and additional views. Please like us on our Facebook page by clicking here! 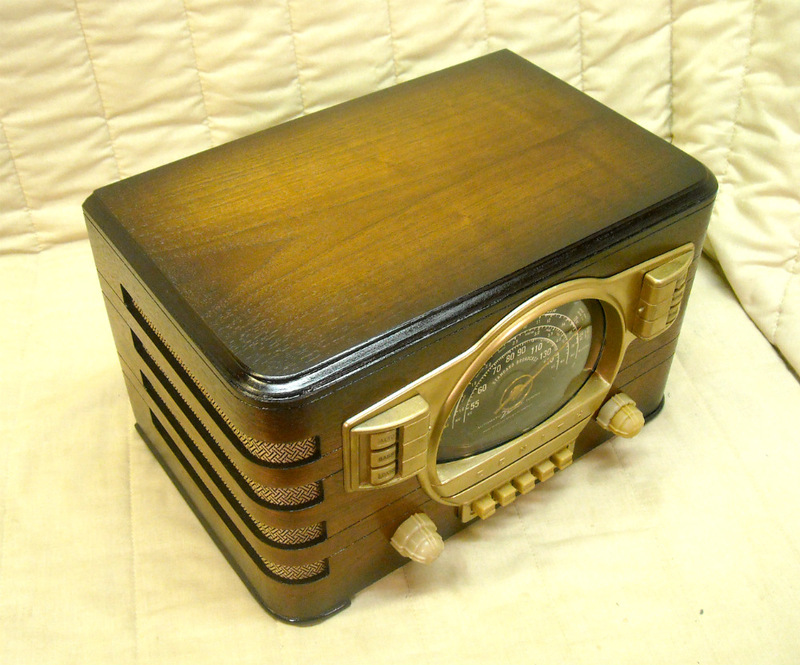 Here we have the highly sought after 1936 Stromberg Carlson model 125-H table radio. This rare beauty features an absolutely stunning rosewood cabinet with striking grain flowing throughout the entire set. The large grill features black grill bars that run from the front of the cabinet, across the top, adding to the great Art Deco appeal. Stromberg Carlson’s trademarked octagonal dial is illuminated by two dial lamps. 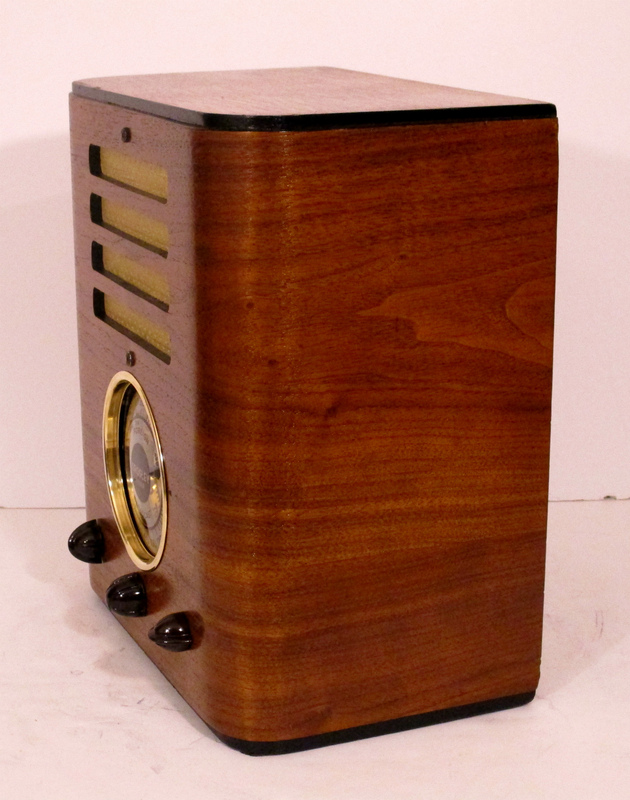 All four wood knobs are in great shape and control the following: on/off & high/low tone, volume, tuning and band switch. With the included copper line antenna the 5 tube chassis performs very well. I am able to pick up many stations across the AM broadcast and shortwave bands with deep rich tone and plenty of volume. Approximate dimensions are 14 3/4” W x 9” H x 8” D. Click on the radio’s picture for larger and additional views. Please like us on our Facebook page by clicking here! 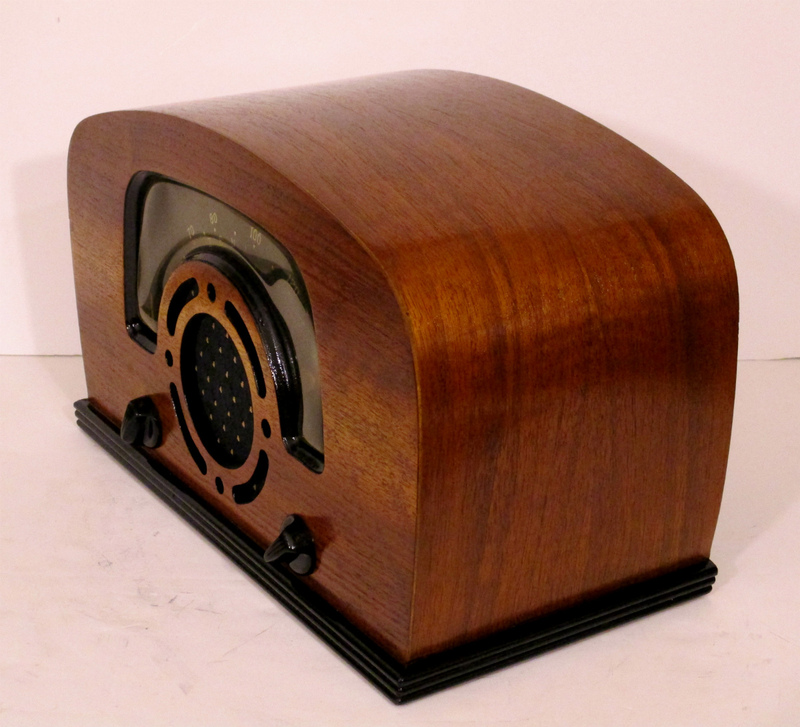 Here we offer a 1938 Serenader model 301 table radio featuring a stunning dark walnut cabinet. A striking burl inlay runs across the center of the cabinet and continues right through the middle portion of the grill. A shiny brass escutcheon surrounds an attractive black and gold dial. The center of the dial features an interesting sun design along with the Serenader logo and a large airplane style pointer. All letters and numbers on the dial are legible and show very little signs of wear. Both knobs are in perfect shape and control on/off & tuning. The set still retains its original heavy cardboard back. With the included copper line antenna the 5 tube chassis performs very well. Approximate dimensions are 12 3/4” W x 8” H x 7” D. Click on the radio’s picture for larger and additional views. Please like us on our Facebook page by clicking here! 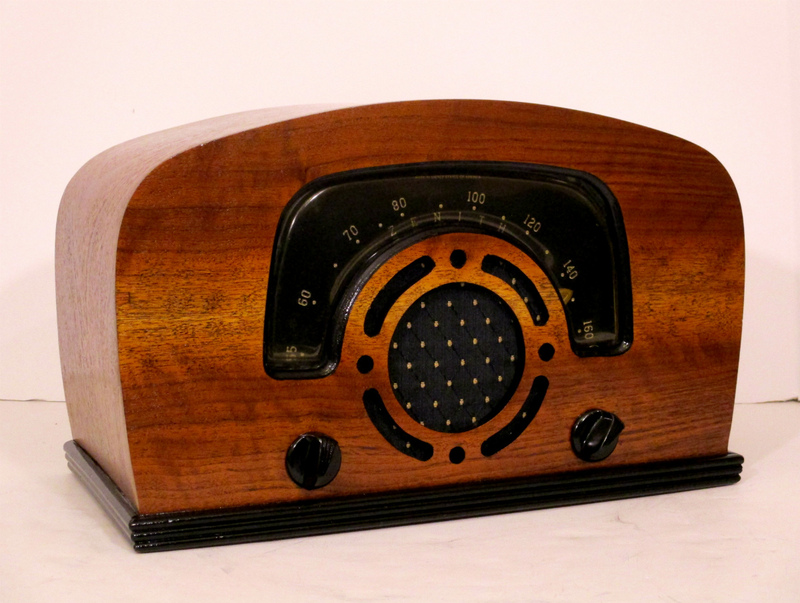 Here we have the highly sought after 1938 Emerson Ingraham model AX-212 table radio. The set has received our professional cabinet and electronic restoration and is quite the head turner! Nicknamed the ‘Little Miracle’, due to its patented miracle sound chamber and miniature size, this little beauty is considered a must have amongst collectors. And you’ll be hard pressed to find a nicer example. The cabinet was designed by Alexis de Sakhnoffsky and made by the famed Ingrham cabinet maker. This model was produced in two types of wood. The first being a dark walnut and this rarer model boasting a stunning maple. It features a terrific streamline design with a protruding conical speaker grill. The 4 pistachio green inlays are in perfect shape and really catch your eye. A front marquetry strip, jet black trim and the Emerson G clef logo finish the cabinet off perfectly. 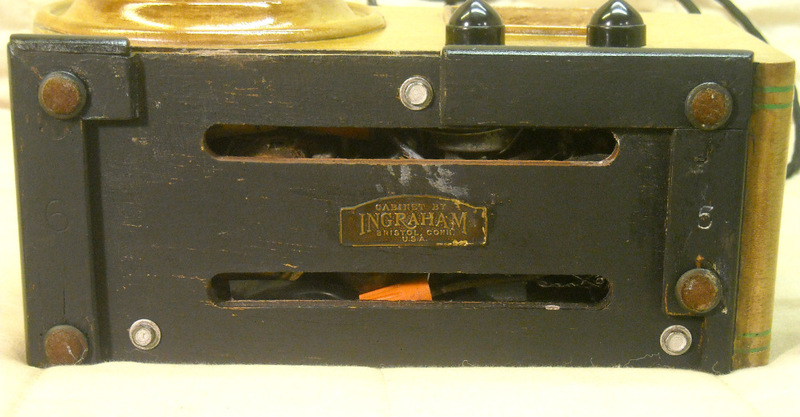 The set still retains its Ingraham name tag on the bottom of the cabinet as well as its original copper line antenna and wood holder! The Gemloid dial lights nice and bright. All letters and numbers are legible and show very little signs of wear. Both knobs are perfect and control on/off and volume and tuning. The five tube chassis performs very well. I’m able to pick up many stations across the AM broadcast band. The set provides plenty of volume and great tone for such a small radio. Approximate dimensions are 9 1/2” W x 5 1/2” H x 4 1/4” D. Click on the radio’s picture for larger and additional views. Please like us on our Facebook page by clicking here! 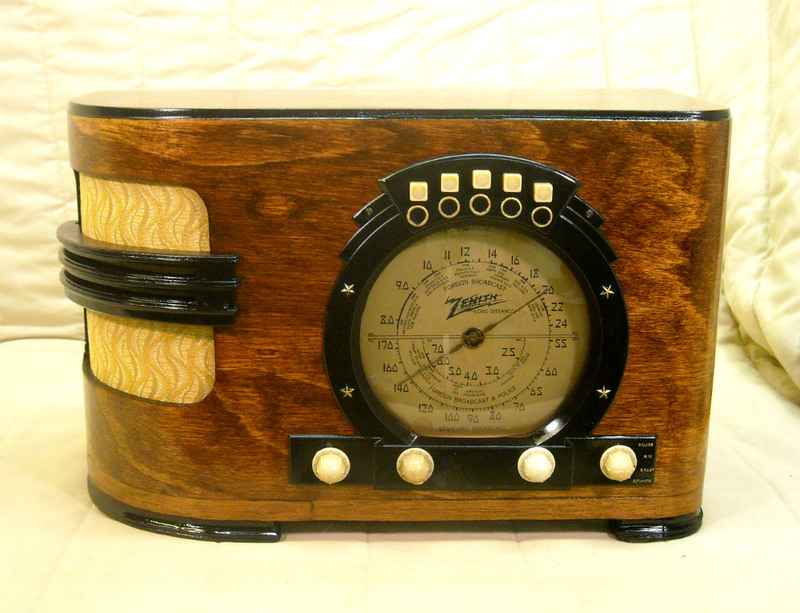 Here we have a stunning 1939 Zenith model 6-S-321 Long Distance table radio. This beauty, nicknamed the ‘Stars and Stripes’, received our professional cabinet and electronic restoration. 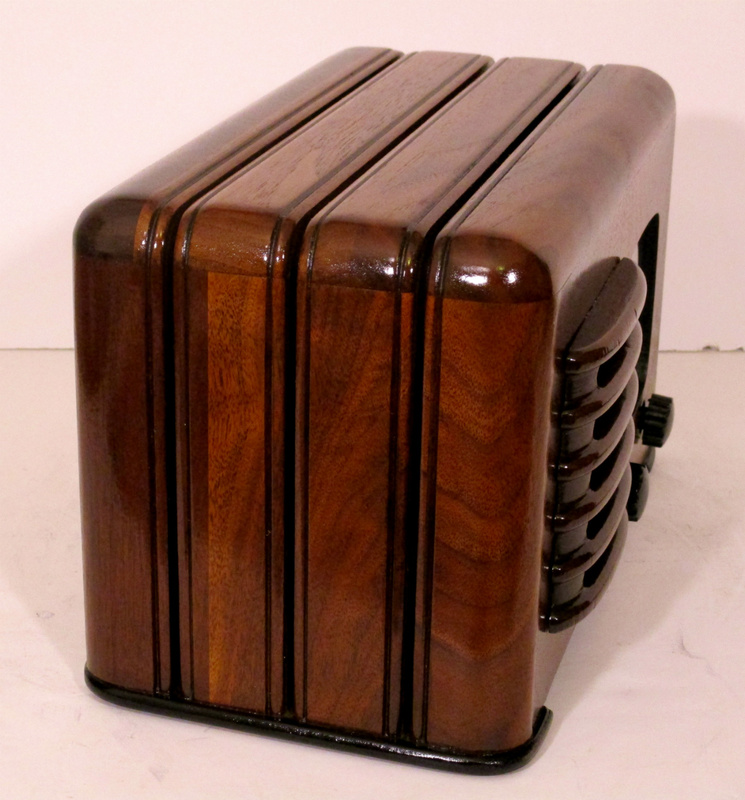 It boasts a beautiful American Walnut cabinet with a wrap around grill and great Art Deco appeal. Black trim adds the perfect contrast on the grill bars and escutcheon. This model features Zenith’s gold dial which is a real eye catcher. It is illuminated by two dial lamps and features a gold background with black letters and numbers represented in a unique font. All letters and numbers are legible and show little to no signs of wear. The dial glass is clear and free from any breaks or cracks. The surrounding escutcheon is what gives this set its nickname. It resembles a waving flag with stars. This patriotic design was common amongst company’s products just prior to the United States entry into WWII. 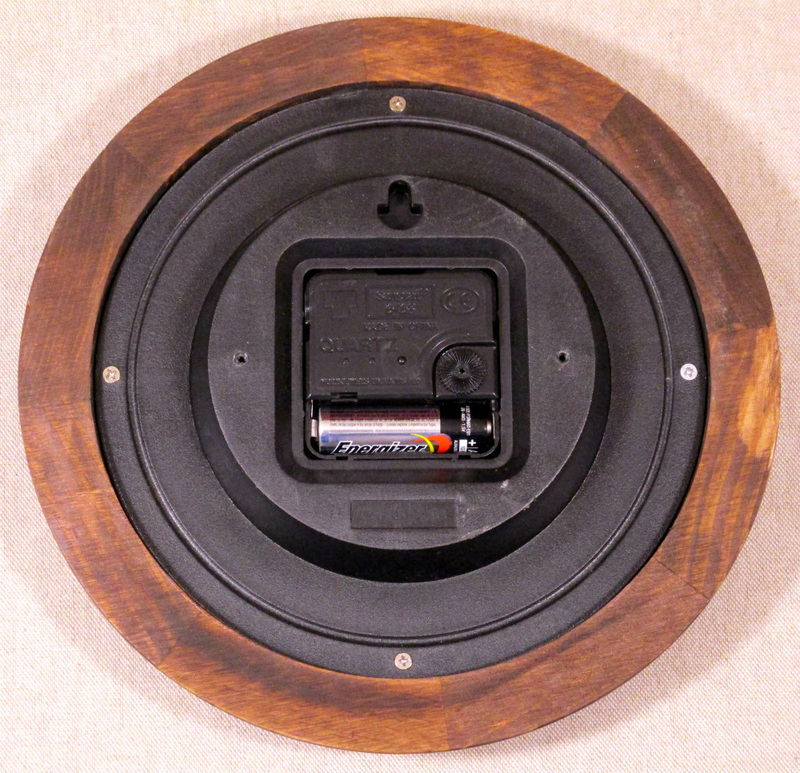 The escutcheon houses 5 fully functional pushbuttons for automatic tuning (which will need to be set by the new owner if you choose to use). The bottom 4 ivory ‘Z’ knobs control on/off & volume, weighted tuning (for quick & pinpoint tuning accuracy), tone control and band switch. The 6 tube chassis performs exceptionally well on both the AM broadcast and shortwave bands. With the included copper line antenna I am able to pick up many stations, up and down the dial, on both bands. The set provides deep rich tone and plenty of volume. Approximate dimensions are 17 3/4” W x 11 1/4” H x 8 1/2” D. Click on the radio’s picture for larger and additional views. Please like us on our Facebook page by clicking here! 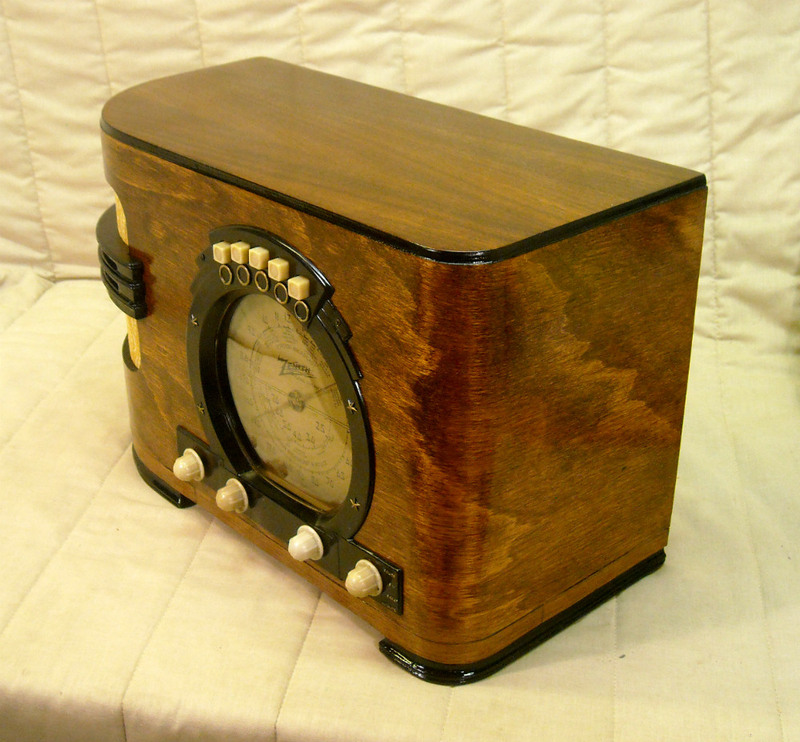 Here we offer a rare 1939 Philco Transitone table radio. 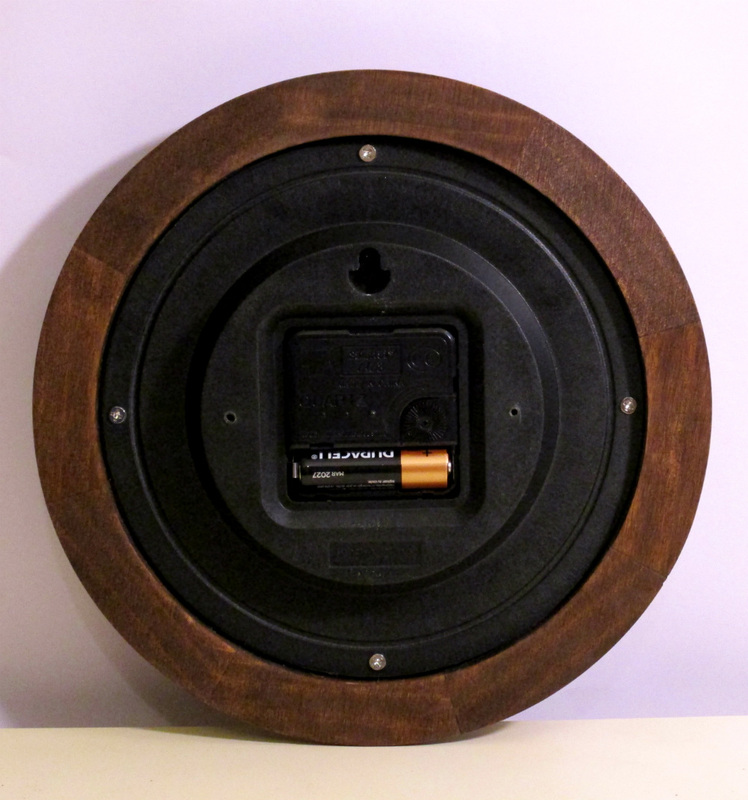 This little guy measures only 10”W x 7”H x 4”D and has quite a history. 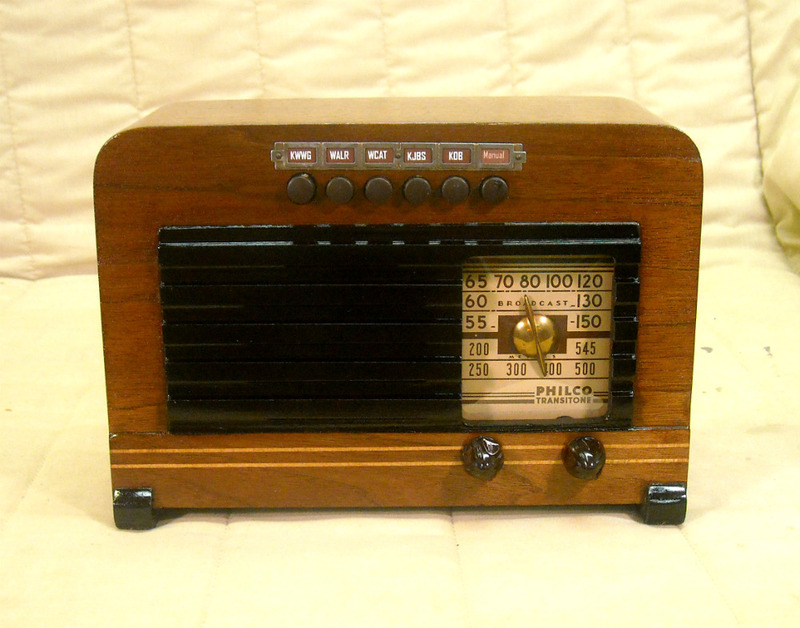 The radio is probably a proto type of the Philco Transistone model TH-15 which was released in 1939. However, when the final version went to production, it measured about 3 inches deeper and included a handle. Only 10,000 of the TH-15 model was produced and I’m sure far less of this smaller proto type model. 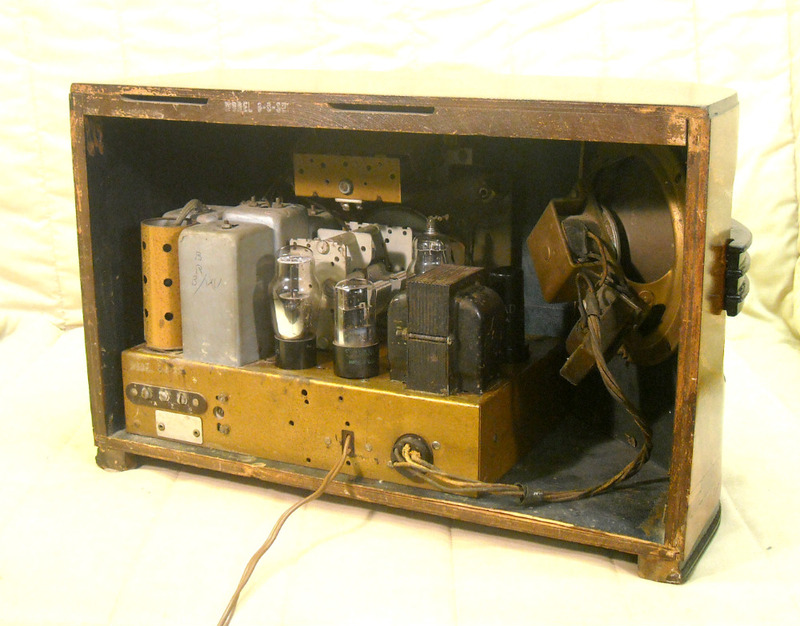 This radio eventually ended up in Pittsburgh where it was used as a background prop for one of August Wilson’s plays called Fences which starred Denzel Washington. 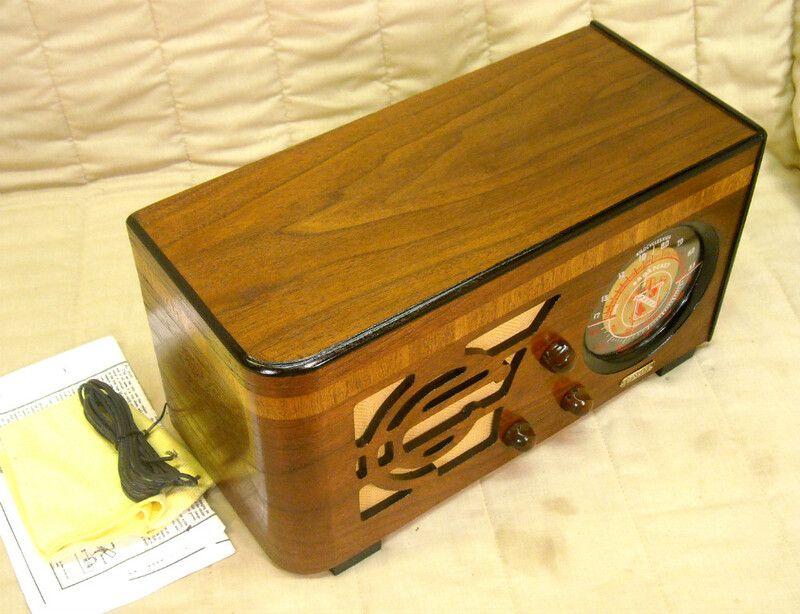 Finally the radio arrived to us where we gave it our professional cabinet and electronic restoration. It features a gorgeous American Walnut cabinet with beautiful wood grain flowing throughout the set. A jet black grill, coupled with the jet black feet, add the perfect contrast. Two blonde inlays run across the bottom of the cabinet. 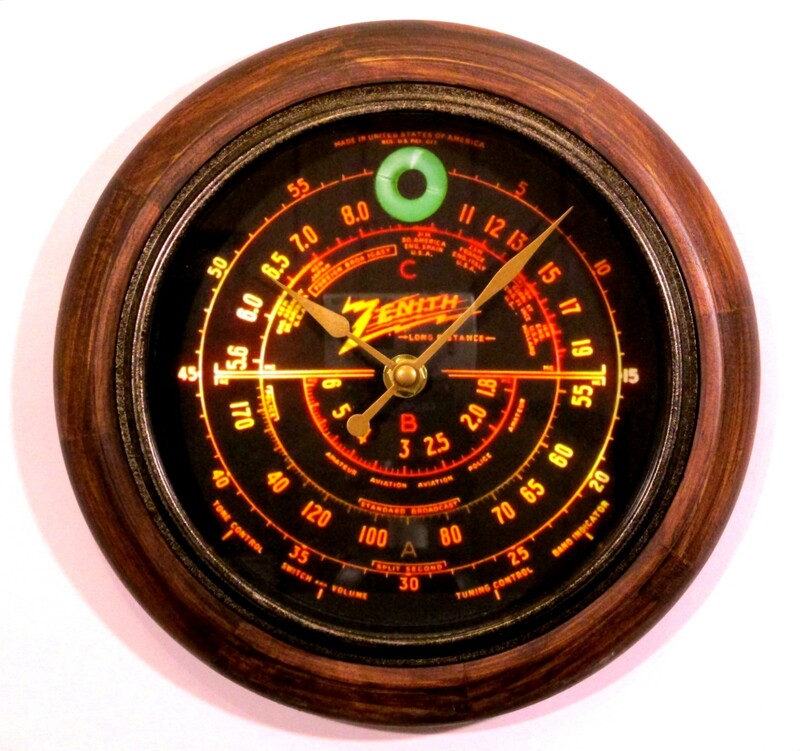 The lighted dial is quite attractive with its ivory & Philco brown colors and large airplane style pointer. The radio boasts an innovative automatic pushbutton tuning mechanism. Once set to the new owner’s local stations, you are there with a push of a button! The far right pushbutton is pressed for normal manual tuning. All station call letters are surrounded by an elegant brass escutcheon. Both bullet style knobs are in perfect shape and control on/off & tuning. 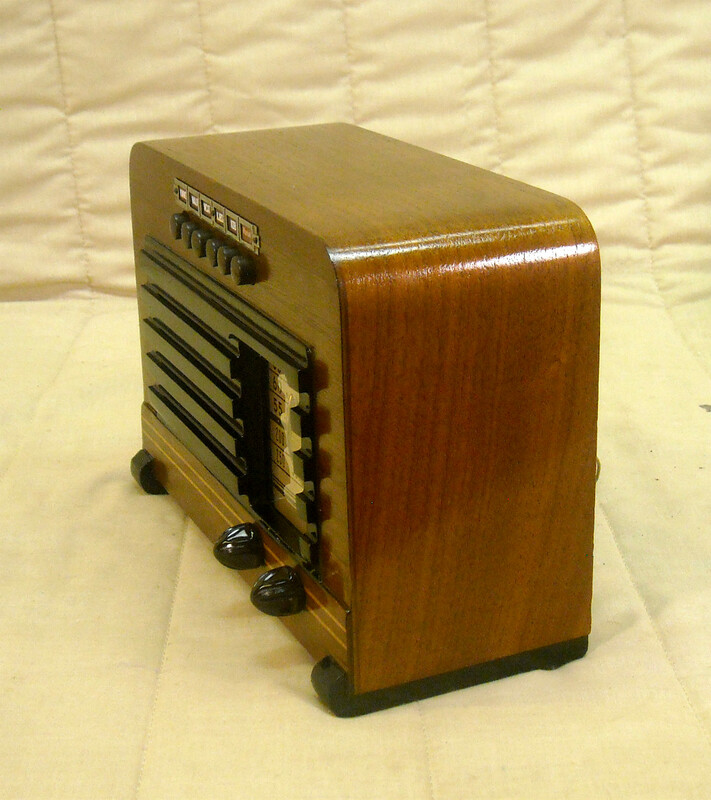 The 5 tube radio plays great across the AM broadcast band. With the included copper line antenna I am able to pick up many stations, near and far, with great tone and plenty of volume. 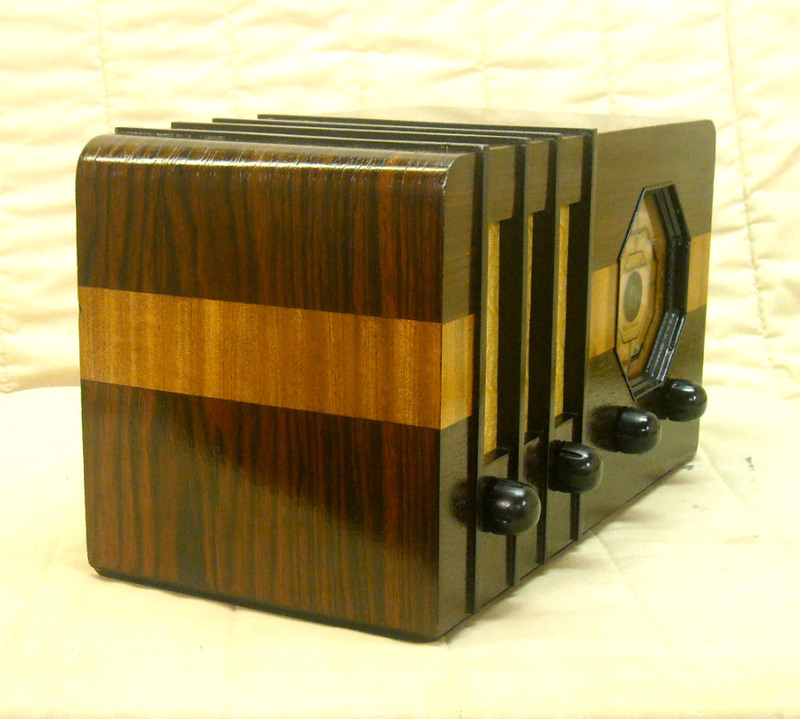 Approximate dimensions are 10” W x 7” H x 4” D. Click on the radio’s picture for larger and additional views. Please like us on our Facebook page by clicking here! 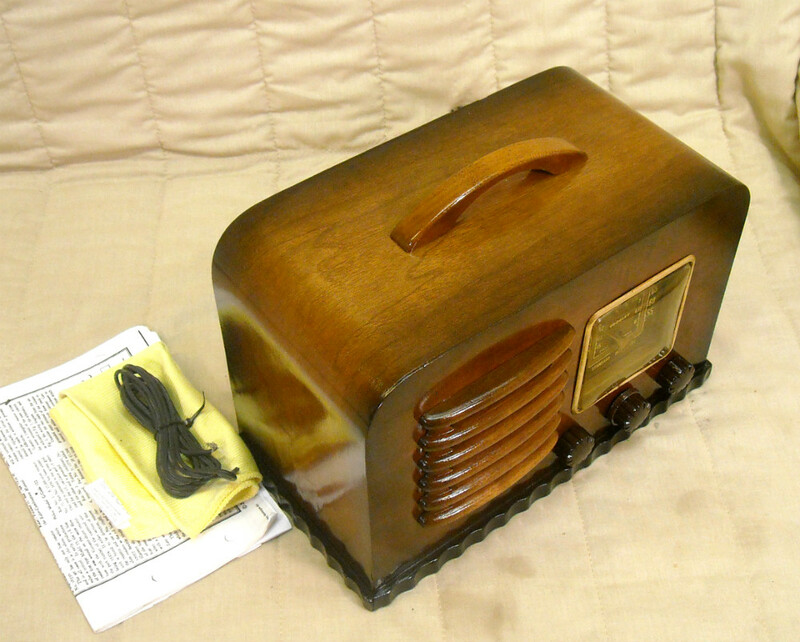 Here we have a rare 1937 Trav-Ler table radio. This beauty features a gorgeous American Walnut cabinet. The rounded left side, coupled with the squared off right side, reminds you of the Art Deco designs so popular in that era. A blonde striped inlay runs across the top of the set and contrasts the jet black trim perfectly. The dial lights nice and bright and features an array of colors from red and black to white and gold. A coat of arms logo is right in the center displaying an arching radio tower, world globe, and red wings. 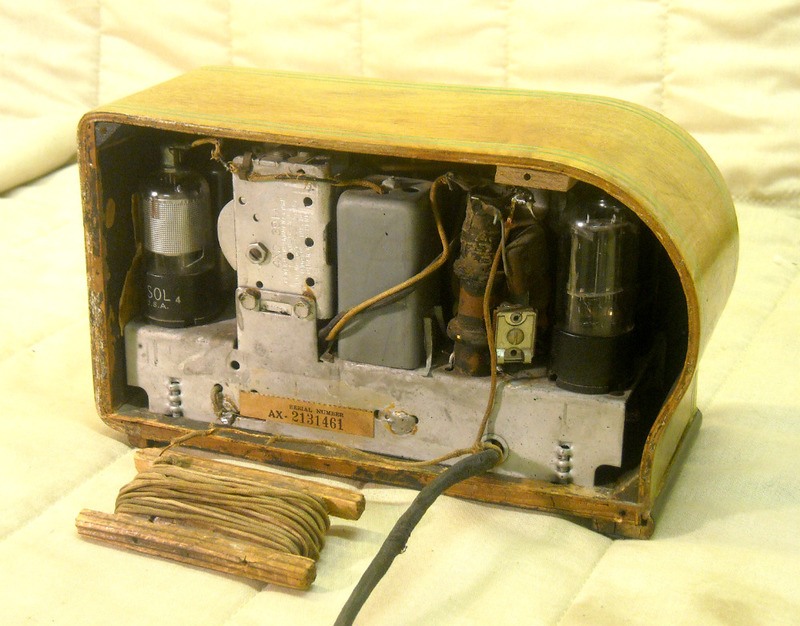 The 6 tube chassis has been given our normal restoration and plays great across the AM broadcast and shortwave bands producing deep rich tone and room filling volume. 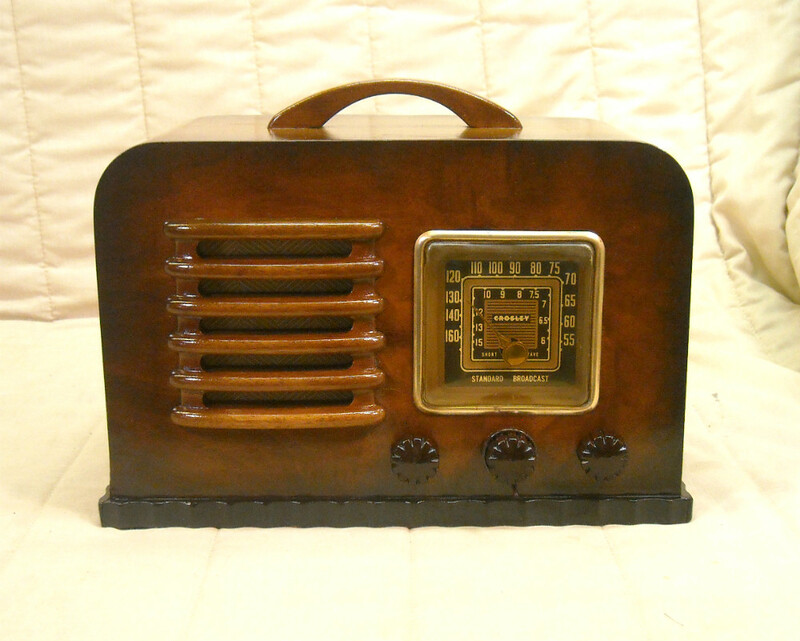 Approximate dimensions are 15 ¾” W x 8 ½” H x 6 ¾” D. Click on the radio’s picture for larger and additional views. Please like us on our Facebook page by clicking here! 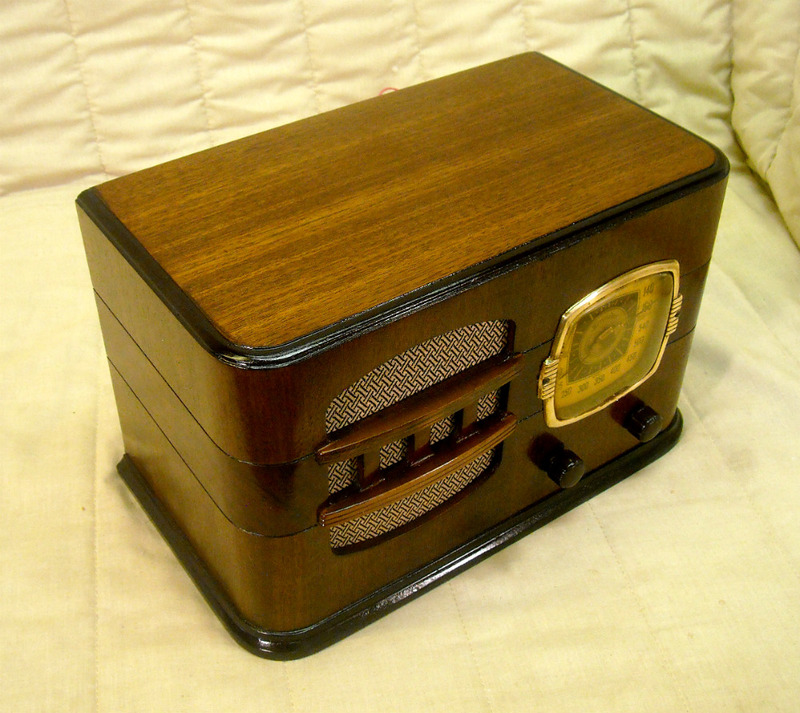 Here we have a stunning 1940 Crosley model 14-AG table radio featuring a gorgeous walnut cabinet, wood grill louvers, attractive lighted dial, top mounted handle, and great performance from the 5 tube chassis on the AM broadcast and shortwave bands. 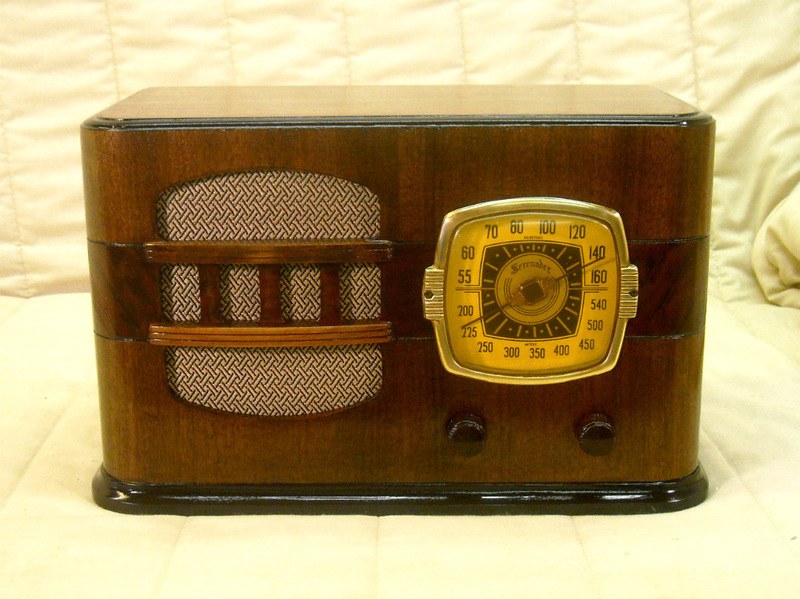 Click on the radio’s picture for larger and additional views. Dimensions: 13 3/4” W x 8” H x 6” D. Please like us on our Facebook page by clicking here! 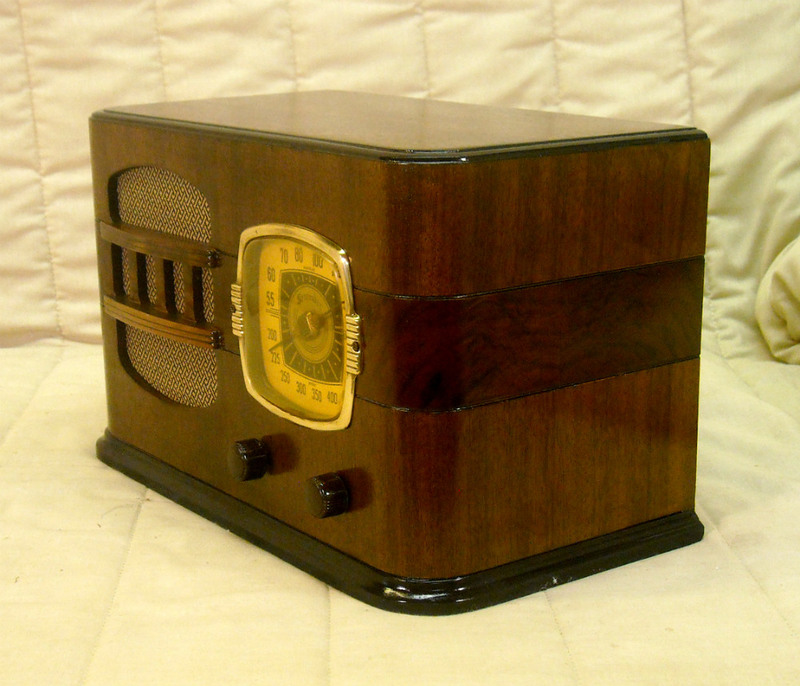 Nothing beats the performance and design of an Emerson radio with a highly sought after Ingraham cabinet. 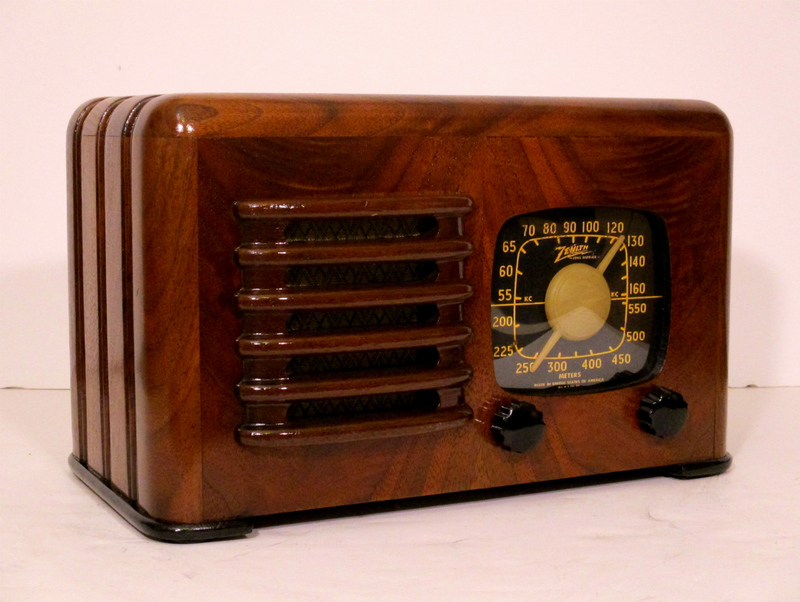 And here we offer one of their finest; the 1937 Emerson model AM-169 table radio featuring a stunning Ingraham made walnut cabinet, attractive gold dial, red pinstripe inlays, wood grill, and outstanding performance on the AM broadcast and shortwave bands. Please like us on our Facebook page by clicking here! 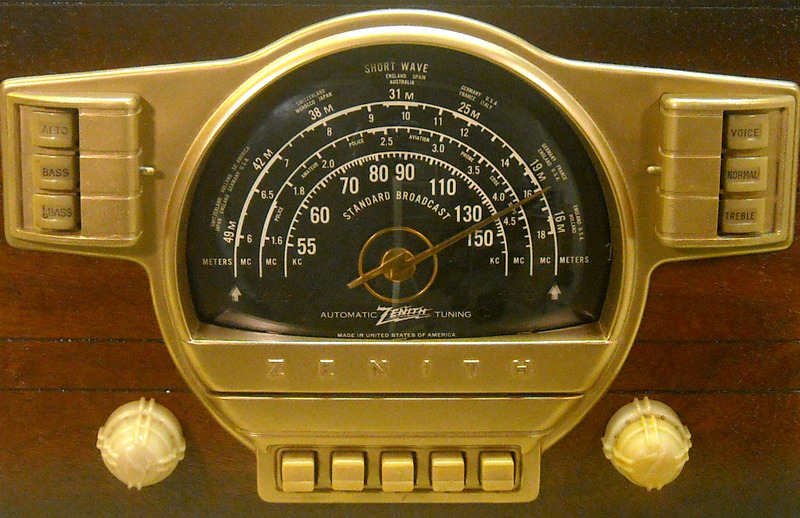 Nothing beats the quality, craftsmanship, and performance of a Zenith radio. And this one is no exception. 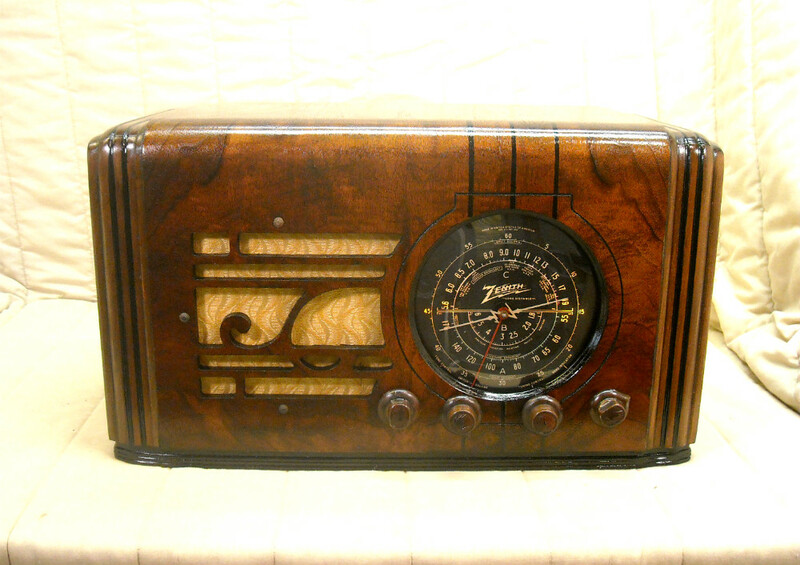 The highly sought after 1937 Zenith Model 5-S-119 'Long Distance' Black Dial table radio. 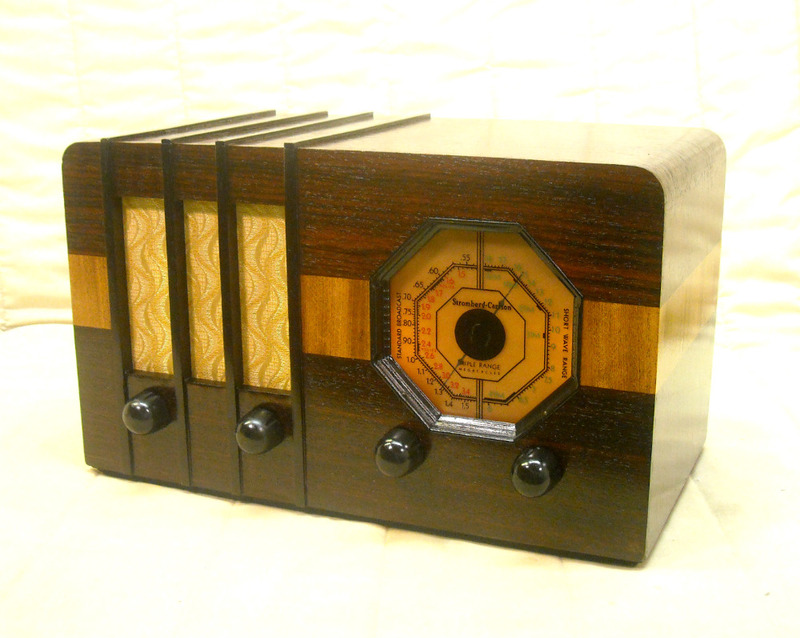 This beauty features a gorgeous dark walnut cabinet with a waterfall top design, stunning back lit black dial, split second vernier tuning, Mp3 / mini jack input, and exceptional performance on both the AM broadcast and shortwave bands.Please like us on our Facebook page by clicking here! 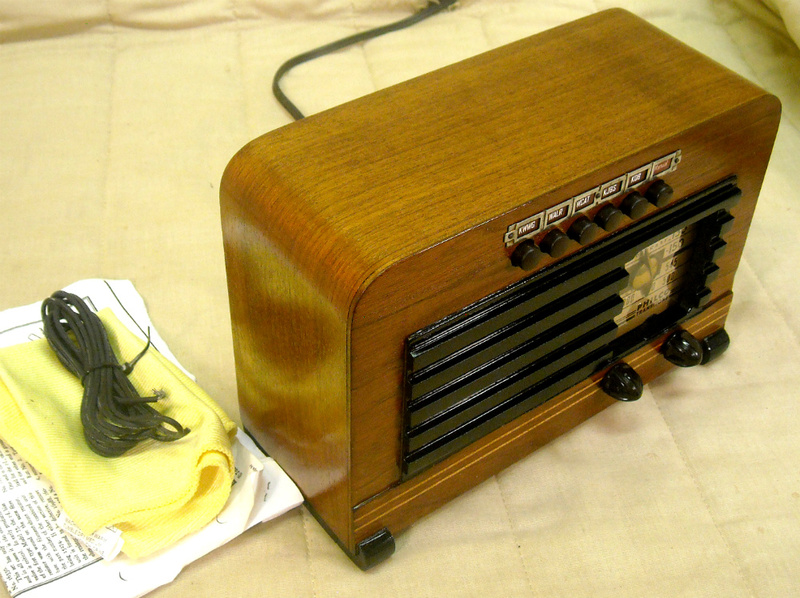 You’ll be hard pressed to find a nicer example of this highly desirable radio. 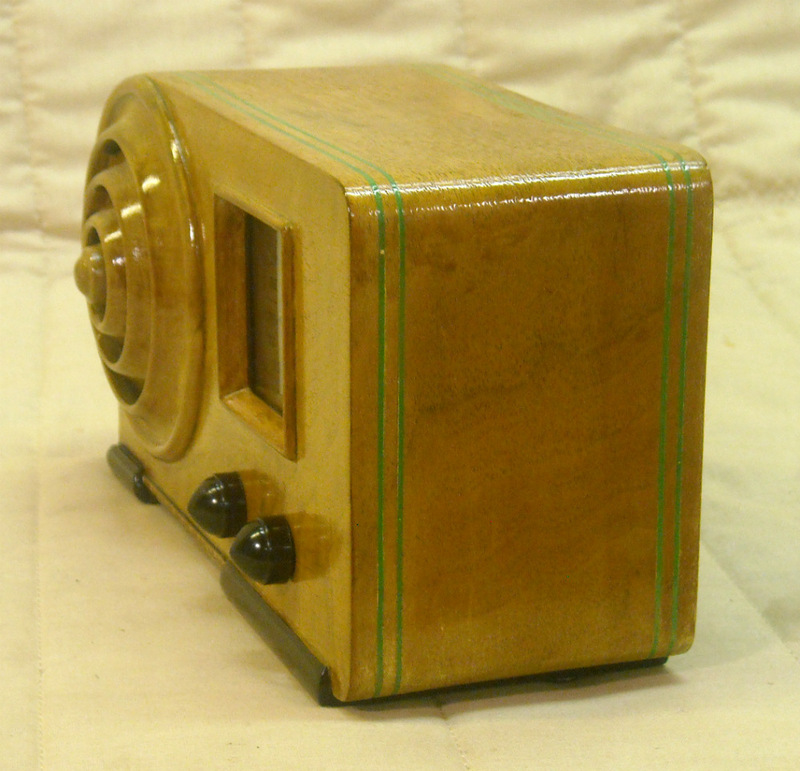 A 1937 Airline model 62-317 table radio featuring a beautiful two tier multi toned cabinet, stunning colorful dial, bright green magic tuning eye, verneer tuning, chrome chassis, and outstanding performance on the AM broadcast and shortwave bands. Click on the radio's picture for larger and additional views.Please like us on our Facebook page by clicking here! 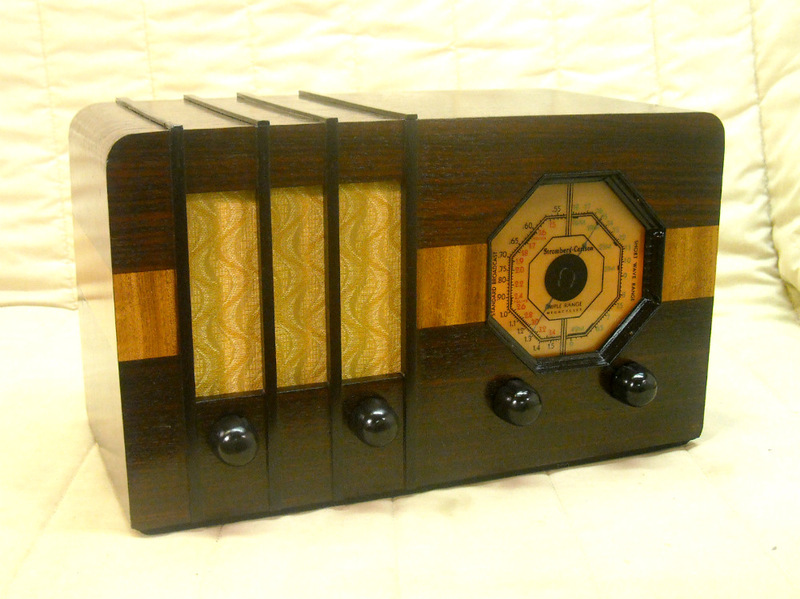 Here we offer one of the sharpest tombstone radios the 1930’s had to offer. 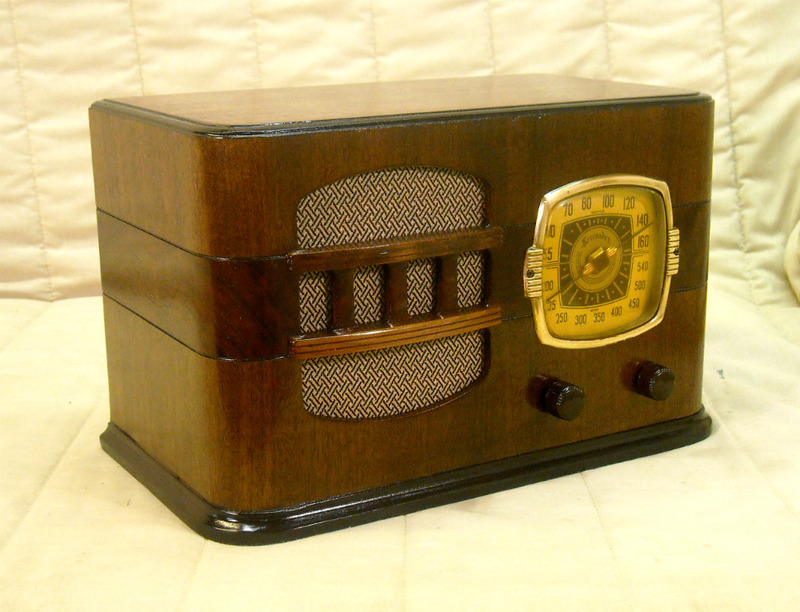 A stunning 1936 Climax featuring a gorgeous dark walnut tombstone cabinet, spectacular backlit dial with mesmerizing 3D effect, great Art Deco appeal, and outstanding performance on both the AM broadcast and shortwave bands. Please like us on our Facebook page by clicking here!